Jobu reviews the Yankees series sweep of the Oakland Athletics. Sorry this is a little late, but holiday weekends tend to mess with my writing schedule. My laziness aside, however, this was a huge series for the Yankees. Sure, the A’s are terrible. Sure, they’re in third place in the AL West and came into this series with a sub-.500 record. But, so what? The Yankees needed to show they could beat up on this team and come into their stadium with a sweep. Thankfully, they did just that. This sweep gave the Yankees five consecutive wins (two to end the series against KC) at a time when they really needed them. Game one of this series pitted an enigmatic Iván Nova against a down right terrible Tyson Ross. The Yankees came into this game riding a two game winning streak that they started at home against the Royals, and they were able to jump all over Ross in this one to extend that streak. Here’s how it went down. Nova went seven innings in this game and only allowed three runs, but I came away from watching his performance in this game still feeling the same feeling I have been getting from all of his starts. “That could have been a lot worse.” Nova continues to struggle with giving up extra-base hits, as he allowed a double and two more home runs in this game. He has now allowed twelve home runs this season, which is just one less than he allowed all of last season. The league is still hitting .313 against him, which is pretty unacceptable, but at least that’s come down a bit in his last couple of starts. I will obviously take three runs in seven innings every time he pitches, but I’d like to see him stop giving up home runs to the A’s, and everyone else in the league. In this game, he was touched up by Josh Reddick (currently on a great power-streak), and Journeyman power-hitter Kila Ka’aihue, so at least the homers were legit, but they were on the same terrible mistake pitches that have plagued Nova throughout the 2012 season. Anyway, he brought his record to 5-2 with the following line: 7 Ip, 6 H, 3 R, 1 BB, 4 K, 101 pitches. Boone Logan pitched a scoreless eighth inning to get the ball to the closer, Rafael Soriano, who gave up a double but closed out the game for his fourth save. Logan has really impressed me of late. He has definitely become much more than just a lefty specialist, and he’s striking out a ton of hitters. He now has a 2.95 ERA, and has struck out 28 batters in just 18.1 innings this season. Soriano, meanwhile, continued his streak of not throwing a 123 inning (the streak is now at 17 appearances so far this season), but he got the job done. ‘Nuff said. The Yankees bats seemed to break out a bit in the last couple of games against the Royals, and they seemed to be starting to hit the long ball more, and that trend definitely continued in this game. They got the scoring started in the third inning when Robinson Canó hit a line drive at A’s center fielder Coco Crisp, who let it go off of his glove and all the way to the wall, scoring Curtis Granderson, who had singled earlier in the inning. The next batter was Mark Teixeira, who rocketed a ball over the right field fence for a two-run home run to give the Yankees a three run lead. It was nice to see Tex hit a ball out of the yard, and he’d have more to say in the second game of this series as well. As for this game, the Yankees wrapped up their scoring with three more runs in the top of the fifth. Canó led off the inning with a rocket home run to dead center field to give the Yankees a 4-1 lead. Tex then came up and doubled, but was thrown out trying to stretch a triple out of things. It was a foolish mistake (you never make that first out at third), but it was good to see Tex able to run like that. This could be a sign that he’s finally getting over his respiratory infection. Raúl Ibañez followed that up with a double of his own, and scored on a line drive, opposite field home run by Nick Swisher. It was Swisher’s first home run in seventeen games, and it would drive in the last runs the Yankees would score on the evening. It was a solid offensive performance for the Yankees and, combined with Nova’s good enough pitching, netted them a win, and the opening salvo in the series. If game one was fun to watch from a Yankees fan’s perspective, game two was even better. The Yankees sent out their Ace, CC Sabathia to face their old friend Bartolo Colón. We all remember what Colón did to help the Yankees win 97 games last year. They chose to keep Freddy García instead of him this off-season. So far this season, that has seemed like a mistake. García has been terrible this season and, while Colón hasn’t been dominant or anything, he’s still been a solid piece of the Athletics rotation. The Yankees would knock him around and chase him early in this game, which probably made them feel a little better about allowing him to get away. Something’s been missing from CC’s arsenal this year. It’s not the speed on his fastball, it’s not the break on his slider and it’s not the change on his changeup (that’s what it does, right? changes?). CC simply doesn’t seem to have command of all of his pitches yet this season. Mike Axisa, of riveraveblues.com, thinks it might have to do with the weight he lost in the off-season throwing his delivery off. To me, that’s as good a theory as I’ve been able to come up with, but who knows? Either way, CC has been wilder this season than in others that I remember. That being said, he did pitch seven innings while only allowing two runs. Even against the A’s that’s a solid performance. The Big Lefty™ only made one real mistake, and that was, of course, to Reddick, whom the Yankees refuse to pitch around despite him being the only guy on the A’s who can swing the bat with any authority. If you throw him an easy pitch down the middle, he’s going to crush it right now. Plain and simple. CC won his sixth game of the year with this line: 7 Ip, 7 H, 2 R, 2 BB, 4 K, 110 pitches. He gave way to Cory Wade and Cody Eppley, who pitched two scoreless innings to end the game. That’s not really a surprise anymore, as the Yankees bullpen has been that damn good, but it’s still nice to give them a shout out from time to time. My brother and I have a running joke this season that, whenever we see Teixiera hit a ball with authority, whether it’s a double or a home run, or any other type of RBI hit, that our televisions are broken because they are showing us impossibilities. In this game, our TVs spent pretty much the whole game on the fritz, because Tex had himself a day. Canó was the one who opened up the scoring though, with a solo homer to right in the top of the second inning. Derek Jeter gave the Yankees their first lead with an RBI single in the top of the third that scored Eric Chavez, but Sabathia allowed the A’s to tie the score in the next inning. In the top of the fourth, Tex began his takeover with a solo home run to right. 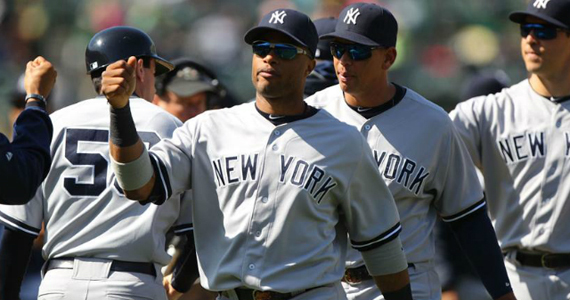 It gave the Yankees a 3-2 lead that they would not relinquish. 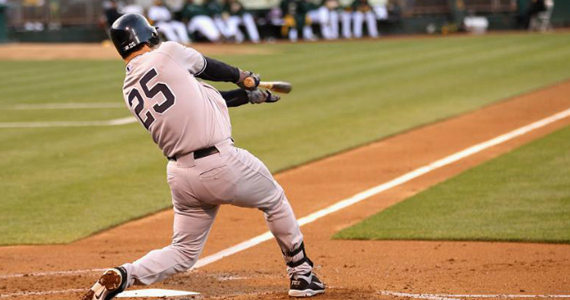 In the top of the fifth, A-Rod drove in Chris Stewart with a sacrifice fly. Canó then doubled to right, which sent Derek Jeter to third and brought up Tex again. His single through the shift drove in both Jeter and Canó, and the Yankees had themselves a 6-2 lead. They added a run to that in the top of the eighth when Jeter was hit by a pitch with the bases loaded, which scored Swisher. Tex put his stamp of approval on the game in the top of the ninth inning when, following a Canó single with his second home run of the night, a towering fly ball just to the left of dead center to extend the Yankees lead to 9-2. 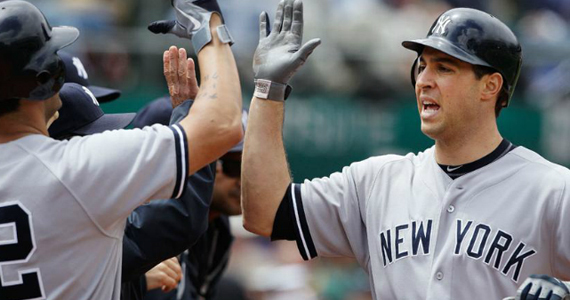 The final numbers for Tex were four hits in five at bats with two home runs and five RBI. Welcome back Tex, we missed you dearly. If offense was the story in games one and two, pitching and defense were the real story in game three. 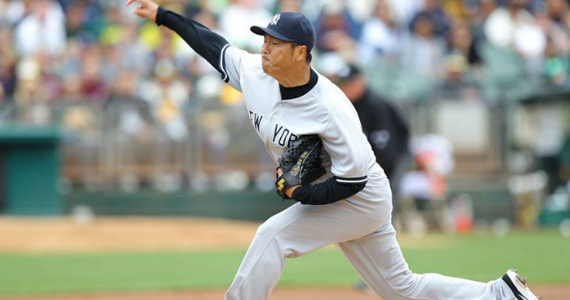 The Yankees sent Hiroki Kuroda to the mound to face rookie Tommy Milone, who came into this game with a 3.75 ERA and six wins in nine starts. Needless to say, the Yankees needed Good Hiroki to show up in this game, and that’s just what they got en route to the sweep, and their fifth straight win. Good Hiroki picked a great team to show up against, and he pitched pretty brilliantly in Oakland in game three. It’s hard to get too excited about this game because we’ve seen Hiroki pitch this well before only to fall back to mediocrity in his next start, but it was still nice to see. I would love for him to be able to put more of these starts together and fully turn his season around. In this game, he pitched eight shut out innings, allowing only four hits and a walk while striking out four. Hiroki was very economic in this performance, only using 104 pitches to get through those eight impressive innings. It was the second time this season that Hiroki has pitched eight shutout innings, the first being in the home opener against the Angels. Thank you Hiroki. The Yankees offense had been firing on all cylinders in the first two games of this season, but they were unable to keep it going in game three against Milone. The Yankees had never face Milone (whom the A’s got in the Gio González trade this off-season) before, which usually spells death for them, but they got all the runs they would need in the top of the second inning. Andruw Jones, starting because Milone is a left hander, did exactly what he’s paid to do when, leading off the inning, he hit a first-pitch fastball well over 400 feet to left-center field. The bomb gave the Yankees a 1-0 lead, and they never looked back. The second run scored in the top of the seventh inning when Tex (who else?) doubled in Granderson to give the Yankees a big insurance run and a 2-0 lead. It wasn’t all candy and nuts for the Yankees in this game. The RISP monster reared its ugly head again, and the team went 1-11 with men in scoring position. It’s not pretty, but a few big offensive games and a win make us all feel a lot better about that. These games happen to the best teams every once in a while, it’s just a matter of not having them happen too often. Notable Offense: HR – Jones (5), RBI – Jones (10), Texeira (29), 2 hits for Teixeira, Jeter passed George Brett with his 3,155th career hit and is now 15th all-time. This column is a lot more fun to write when they Yankees are playing well and winning ballgames. As of the time I am writing this, they own a five-game winning streak heading into Anaheim for a three game series against the Angels. It’s never easy for the team to win in Anaheim, but they stand a much better chance than they did before, now that Teixeira is hitting. The slugging first baseman is finally getting over his infection and hitting the ball with tons of authority. In the series, he went 8-14 with three doubles, three home run and eight RBI, and raised his average from .226 to .254. That number is still lower than you’d like it to be, but it seems to be starting to get there. With Canó also hitting very well, it should be enough to spark the rest of the lineup and could lead to a lot of wins.